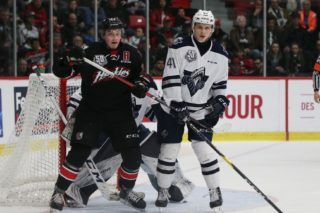 The Sherbrooke Phoenix and Blainville-Boisbriand Armada faced each other seven times during the 2018-19 QMJHL regular season. 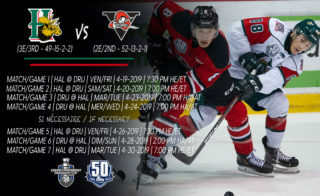 That familiarity could serve both teams well as they embark on their first round President Cup playoff series, which starts on Friday night in Sherbrooke. The Phoenix tied a franchise high with 36 wins during the regular season and their 77 points were good for third in the Western Conference. The Armada, after experiencing considerable roster turnover both leading into and during the campaign, finished sixth in the conference with a 26-40-2 record and 54 points, the lowest such total in franchise history. The Phoenix, currently in its seventh season of operations, is making its fifth appearance in the President Cup Playoffs. Last year saw the club emerge from the first round of the postseason for the very first time when they eliminated the Rouyn-Noranda Huskies in seven games. 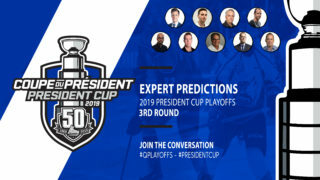 They would subsequently lose to the eventual President and Memorial Cup Champion Acadie-Bathurst Titan in a four-game sweep during the league Quarter Finals. The Armada is coming off an impressive run of back-to-back appearances in the President Cup Finals. Both times, the team fell victim in the championship round to New Brunswick-based squads. 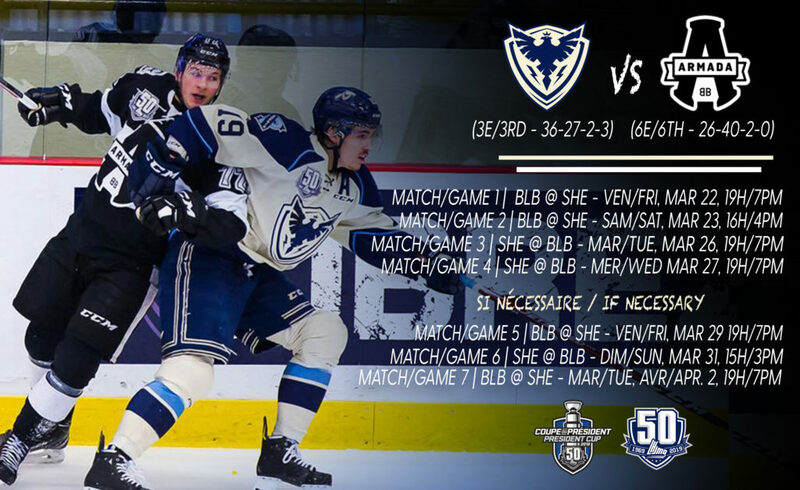 In 2017, the Saint John Sea Dogs defeated the Armada in a four-game sweep while the aforementioned Titan did the same in a six-game set last year. The Armada franchise holds the proud distinction of never having missed the playoffs, a streak that traces its roots back to 2006, when the then-expansion franchise was located in St. John’s and known as the Fog Devils. The Phoenix took the season series over the Armada, 5-2. Their most recent clash took place on February 19th in Boisbriand, when a pair of 2017 QMJHL first-rounders, wingers Samuel Poulin and Bailey Peach, combined for 10 points in an 8-4 Phoenix victory. The last Armada victory occurred on January 13th in Sherbrooke. Overaged winger Tyler Hylland, at that time a recent acquisition by the Armada, netted a hat trick in his new club’s 7-4 come-from-behind triumph over the Phoenix. Poulin would lead the Phoenix in scoring with 29 goals and 76 points in 67 games, finishing the campaign as one of five 20-goal scorers for a Sherbrooke team that featured an evenly distributed offense. Third-year veteran Ryan DaSilva, formerly of the Armada, led all Phoenix blueliners with 44 points. Between the pipes, Dakota Lund-Cornish made his debut as a starting goaltender in the “Q” following his acquisition from the Charlottetown Islanders during the holiday trade period, winning 12 games with one shutout in the process. The Armada was led in scoring by fifth-year veteran Alexander Katerinakis, who produced 50 points in 67 games. Second year center Luke Henman put up 46 points, while Samuel Bolduc led the charge from the blueline with 37 points. 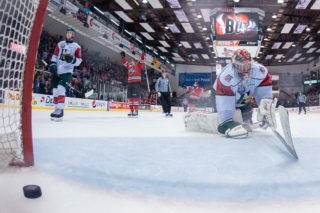 Six different netminders tended the twine in Blainville at one time or another this season, with last year’s playoff sensation Émile Samson sporting an 11-10-1 record before going down with an injury in December. Brendan Cregan would step in to post 11 victories of his own after being acquired from – ironically – the Phoenix, in December. This is the first playoff clash between these two clubs. 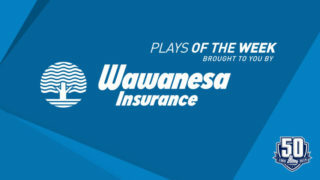 The Phoenix, who will be looking to advance to the Quarter Finals in back-to-back years for the first time, will also try to stop the Armada from reaching the Finals for a third straight campaign. 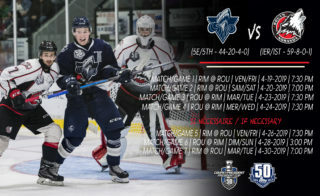 Finally, for two teams that produced modest offensive totals – Sherbrooke was ranked 10th and Blainville-Boisbriand 14th in goals for this year – they certainly didn’t shy away from opening things up against one another during the season series. The two clubs combined for 60 goals over the course of seven games; 32 for the Phoenix versus 28 for the Armada. Amazingly, they even managed to throw one shutout victory in the mix (a 2-0 Phoenix win in Sherbrooke on December 12th)!